Invariably there comes a day when it makes more sense to call a plumber than to try and fix it yourself. Unless you know a plumber, or have a great referral, how do you know whom to call? Take a look at these 5 ways to evaluate a plumbing service before you hire them. 1. Know the job before you call. Sure, some jobs turn into much bigger problems than anticipated. But for the majority of calls, you should have some idea of what the problem is. Be honest and upfront with the plumber when you’re calling to ask for a quote. Give him an idea of how long the problem has been building up, what the cause is, and what the effects are. 2. Avoid emergencies. When you have an emergency, you may end up taking the first plumber that can make it to your home. With a little bit of anticipation and maintenance, you can avoid the big problems, and concentrate on keeping things running effectively. 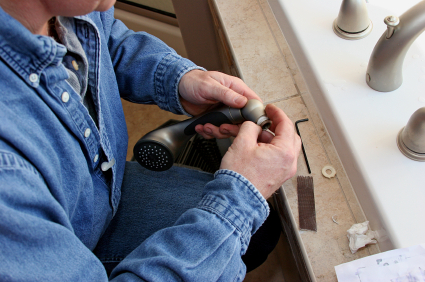 It’s much easier to find a qualified plumber for routine maintenance – one you can trust for his expertise and knowledge – than relying on the first one to answer the phone. 3. Think green. If you’re starting to change the way you live, and incorporating more green living tips into your life, think green when it comes to plumbing too. Maybe you’ve started using stainless steel water bottles, and microwaving in glass bowls instead of plastic. Now think about the chemicals you’re using to clear clogged drains. Your plumber can make suggestions to avoiding dangerous chemicals, and still leave your sinks running smoothly. 4. Plan and save. If you’re thinking of updating a bathroom, do your shopping and price comparisons before the date of the project. Choose your faucets, showerheads, and new toilets. A reputable plumber will be happy to install your purchases, and give you the added service of clearing and maintaining your drains and pipes while making the installations. 5. Spend five minutes doing research online. If a company is reputable, they will have a quality web presence. Look at their site and read through their pages. What associations do they belong to? What guarantees do they have? It’s easy to form an opinion about a company within just a few minutes. Trust your instincts, and do your research.